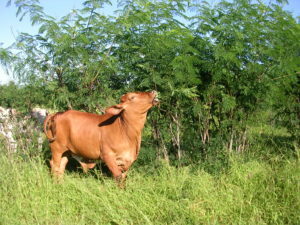 Producers grazing cattle on leucaena pastures will know about the inoculum provided by the Department of Agriculture and Fisheries (DAF) which allows their animals to safely eat leucaena. What they may not know is that a Meat & Livestock Australia (MLA) funded project investigating the inoculum has just been completed and the final report is now available for them to read! The inoculum has been produced by DAF for over two decades and the aim of the project was to define the bacterial composition of the inoculum, determine if there had been any major changes in inoculum composition over the last 20 years and to determine the survivability of Synergistes jonesii along the supply chain (production, storage and transport to the producer). Dr Athol Klieve’s rumen ecology team found that only small changes in the bacterial composition had happened over the 20 years of producing the inoculum. Team member Dr Carl Davis identified that there has actually only been one strain of S. jonesii (the bacteria that breaks down the toxin) in the inoculum since fermentor-based production started. In going back and testing historical samples, the team found that the levels of S. jonesii in the inoculum had remained stable over the entire time of production. When different production chain scenarios were tested it was determined that cryo-protecting and storing at -20 °C had little effect on the viability of S. jonesii and its ability to degrade the toxins 3,4-dihydroxy pyridone (3,4-DHP) and 2,3-dihydroxy pyridone (2,3-DHP). Allowing the frozen inoculum to thaw and keeping it at 2 – 8 °C for 30 hours had little effect on the survival of S. jonesii and it was still able to effectively break down 3,4 and 2,3 DHP. These findings suggest that reductions in S. jonesii viability due to conditions along the supply chain are unlikely to impact on the overall ability of the inoculum to establish and maintain its activity in the animal’s rumen. The entire final report for the project has been uploaded to the MLA website. If you’d like to read it, visit the MLA website and look under the Research & Development tab at the top of the page and click on Search R&D reports. On the Search R&D reports page put the words Leucaena rumen inoculum composition into the keywords box and then click on the search button. 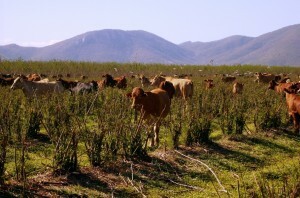 This will bring up a number of results and the report is called ‘Leucaena Rumen Inoculum – composition and activity along the supply chain’. Just click on this project and it will take you to the topic and you will find a link to download the report.